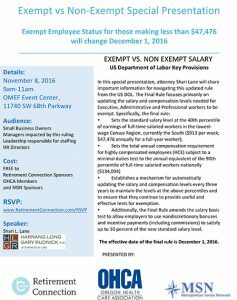 Exempt Employee Status for those making less than $47,476 will change December 1, 2016 and many companies are scrambling to decide how to make decisions about how this will effect current and new employees. Join us for special presentation by Shari Lane as we go over how the Final Rule will effect you and your business. This presentation is specifically geared for small business owners, managers impacted by this ruling, leadership responsible for staffing, and HR directors. RSVP Online today to Reserve your spot!